"MIT engineer Amy Smith designs ingenious low-cost devices to tackle tough problems in developing countries. She received a MacArthur "Genius" Grant in 2004, and was the first woman to win MIT's famed Lemelson Prize. In this talk, she explains the vision behind her inventions, which include eco-friendly charcoal and a laboratory incubator that doesn't require electricity. (Recorded February 2006 in Monterey, CA. Duration: 15:48)"
Haiti is in dire need of an alternative fuel source. Currently, wood and wood-based charcoal are the primary cooking fuels in Haiti, but the country 98% deforested. Wood for charcoal is extremely scarce and demand creates soaring fuel prices and environmental devastation. With an average income of about one dollar per day, imported fuels are not a viable option. In Haiti, wood and wood charcoal are common fuels for cooking. This practice has contributed to deforestation, leading to erosion and fatal floods. The availability of charcoal made from a different source other than wood, such as agricultural waste, might provide Haitians with an alternative, more sustainable fuel, which in turn may reduce fuel prices. MIT students have developed various methods for producing charcoal out of simple inexpensive devices. In a current manufacturing process, carbonized bagasse is crushed to a powder, then mixed and agglomerated with yucca binder into balls. A novel method may reduce operator exposure and inhalation of charcoal fines by keeping primary manufacturing phases in the oil drum and reducing the operational steps of transferring the material from one location to another. The goal of this thesis was to understand, test, and optimize the parameters of this novel crushing and agglomeration process. The final prototype was found to effectively crushing charcoal and mix charcoal with binder to some extent, while being an inexpensive alternative to reduce overall charcoal exposure. However, the mixing and agglomeration was not sufficiently uniform and further designs should be considered to increase uniformity of mixing of binder and charcoal. 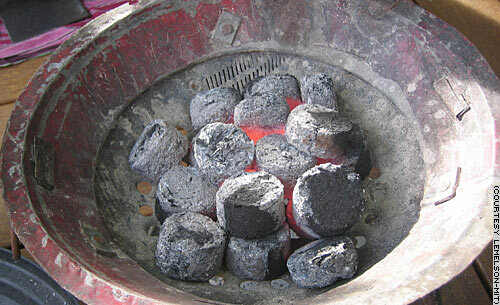 Here is a picture of the charcoal being made and apparently the typical cooker.